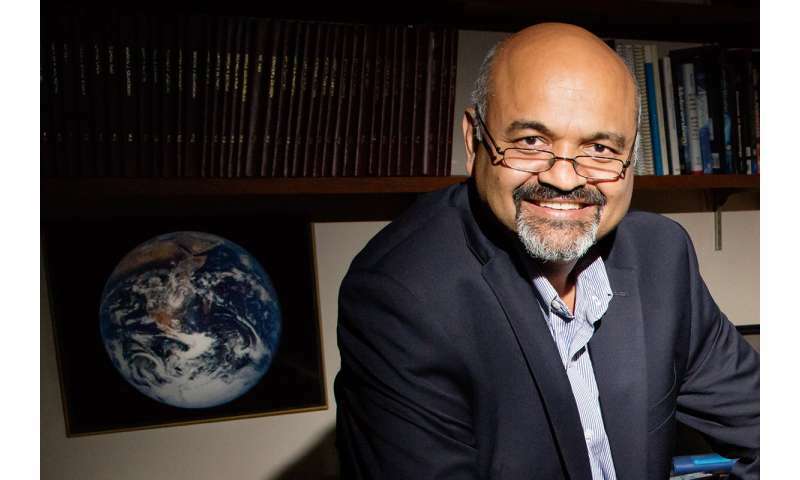 Illinois atmospheric scientist Atul Jain was among the many scientists worldwide who contributed data to the Global Carbon Budget 2017, released Nov. 13. Jain talked about this year's findings with News Bureau physical sciences editor Lois Yoksoulian. What is the primary purpose of the annual carbon budget assessment? The budget estimate is essential to better understand the global carbon cycle, support the climate policy process and project future climate change. The process helps determine accurate annual assessments of human-generated carbon dioxide emissions and their redistribution among the atmosphere, ocean and terrestrial biosphere. What is different about this year's findings? Global CO2 emissions from fossil fuel burning are on the rise again in 2017 after three years of stability between 2014 and 2016. The study suggests that global CO2 emissions from all human activities will reach 41 billion tons in 2017, following a projected 2 percent rise in burning fossil fuels. The most significant contributing factor in the reversal of global emissions growth is that China, the top CO2 emitter, was behind the unexpected recent slowdown in emissions growth but is again a key driver with a projected emission growth of 3.5 percent in 2017. Carbon dioxide emissions are expected to decline by 0.4 percent in the U.S., the second top emitter, which are smaller declines than what we saw during the previous decade. It is important to note that 2017 will be the first time in five years that U.S. coal consumption is projected to rise by about 0.5 percent. However, India's emissions are expected to grow by just 2 percent. This projection is down from over 6 percent per year during the past decade. Our study findings suggest that an actual decline in global emissions might still be beyond our immediate reach, especially given projections for stronger economic growth in 2018. At the same time, the emission-reduction commitments of many countries to make the Paris Agreement a success suggest that CO2 emissions may not return to the high growth rates experienced in the 2000s. However, it remains to be seen if the countries stick to their commitment. Otherwise, the Paris Agreement goals to stabilize our climate at well below 2 degrees Celsius of global warming could quickly slip out of reach. Why is it important to reassess the annual carbon budget annually and not, say, every five years? Performing the process each year, rather than every five years, improves the accuracy of the estimated carbon budget over time. The global carbon budget assesses the mean, variations and trends in the concentration of CO2 in the atmosphere since about 1860 – the beginning of the Industrial Era. The Intergovernmental Panel on Climate Change has assessed the CO2 average decadal budget for the 1980s, 1990s and 2000s. The Global Carbon Project has adapted the IPCC approach but also projects fossil fuel emissions and atmospheric CO2 concentrations for one additional year. For example, this year, GCP reported the budget for the decade 2007-16 and the fossil fuel emissions and CO2 concentrations for the year 2017. The report mentions a difference in how the assessment is performed now. Why is that? The carbon budget is determined by using a combination of data, algorithms, statistics and model estimates of carbon stocks and fluxes and their interpretation by a broad scientific community. Global fossil fuel and land use emissions and how they are partitioned among the atmosphere, ocean and land are, in reality, in balance. However, due to the uncertainty of some of the estimated numbers and smaller terms not included in our budget estimate, their sum does not necessarily add up to zero. Therefore, this year we introduced a budget imbalance, which is a measure of the mismatch between the estimated emissions and the estimated changes in the atmosphere, land and ocean. The term "uncertainty" is used a lot in carbon budget calculations and is often misunderstood to mean that scientists are unsure of what they are doing. Can you elaborate? In science, uncertainty does not imply ignorance, but how statistically confident we are about our results, and we reduce uncertainty in our results by research. Even though we may be able to detect a change in CO2 emission trends and variations in carbon sinks today, it may take many more years to confidently and independently verify a sustained change in emissions using measurements of atmospheric concentrations of CO2. Therefore, each year GCP updates and revises the data along with any changes in analysis, results and the most up-to-date interpretation of the behavior of the global carbon cycle.